• Locate and double-click the TRFAADBAdv.EXE file (if you have performed a default installation, this file is located in c:\Program Files\SSTC\TRFA DP Advanced\Bin). Analysis Database is used for economical storing and easy managing of results of analysis, which has been performed in TRFA Data Processor Advanced. It provides convenient and fast way of searching and retrieving information. This software let one to get rid of a great amount of paper needed to keep information about the measurements, performed analysis as well as to avoid routine manipulation with computer files, folders, etc. Database consists of several tables with the automatically supported relationships between them. generating and printing user-defined reports on the base of the selected records. Database supports data integrity and validity. All information concerning the defined object is stored in one record in table. The mechanism of data integrity forbids deleting a record from one table which is linked to the records in the other tables. Data validity guarantees that values stored in the tables are always valid by the checking of the range and type of the entered data. Database is protected from the accidental changing or deleting of information by the default forbidding of editing. Database avoids data redundancy: each record has only one instance. It means that it is not required to enter information into the tables, if the same information is already stored in the database. User can just establish the relation between the entered and stored information. This feature is especially useful when one needs to update records in the database. The correction should be done only once at one point (where the changed information is stored) and then this update will take effect in all records which are related to the selected one. Database provides extensive possibilities for searching information. The fastest way how to find a record by a specific field is by typing first symbols of this field in a special window. Cursor moves to the record with the field, which contains symbols matching the typed ones. The possibility to sort any table by any field is also supported. User may also interactively create filter with complex conditions in order to decrease the selected number of records. Such operations as looking through the records, deleting records, editing information are provided by Database Navigator. Menu and Toolbar provide quick way to invoke the commands of the application. Analysis and Parameters pages display all information about one particular analysis. Status bar, which is a horizontal area in Analysis Database below the pages, provides information about the current state of application and any other contextual information. File Contains menu commands for importing/exporting data. Find Contains menu commands for finding information. Sort Contains menu commands for sorting tables. Preview Contains menu commands for previewing graphs of analysis results, estimated parameters dependence and DataSet properties. 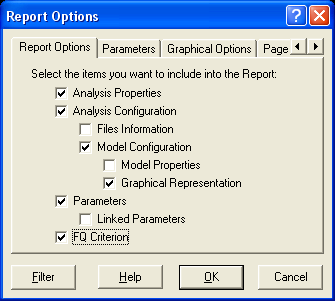 Reports Contains menu commands for setting the page setup and previewing and printing automatically created reports. Tools Contains menu commands for communicating with TRFA Data Processor Advanced and performing some service database functions. Help Contains menu commands for accessing the online Help and information about the copyright. Use commands of the File menu for importing/exporting a data. Export to ASCII Opens Export data dialog box that allows exporting the arrays of experimental and recovered characteristics and residuals to the text file. New Tables Opens New Database dialog box to create a new empty Database (set of tables) allowing to keep data in different folders or computers within the local network. One have to specify the Alias for this Database during this operation. An alias is a name and a set of parameters that describe a database resource. BDE applications use aliases to connect with databases. Link Tables Opens Link Tables dialog box for switching between Databases at run time. Import from Database Imports Analysis(es) with all supplementary information from the selected database to the current Database. Opens Import/Export Data form to select the Database and Analysis(es). Export to Database Exports Analysis(es) with all supplementary information from the current database to the selected Database. Opens Import/Export Data form to select the Database and Analysis(es). Exit Finishes the work with Analysis Database. Use the commands of the Find menu for finding information. Quick Search Displays a search box for the corresponding field. If you want to find quickly the necessary record you should type the first few characters and click Enter. In this case the application will automatically select the first record that contains at the beginning the characters, which matched the typed ones. For the Numeric, Logical and Data/Time fields you should type the whole value for the correspondent field. To close the search box, click Esc. Filter Opens Filter dialog box that allows creating the filter that can be applied to the selected table If this filter is applied, the only table records that correspond to the filter criteria will be displayed. Filter by selection Filter a table by a selected field. If the filter is applied, the only records that contain selected text are displayed. Remove All Filters Removes the filter from all tables. Use the commands of the Sort menu for sorting tables. Ascending Sorts records of the table in ascending order by the selected field. Descending Sorts records of the table in descending order by the selected field. Use the commands of the Preview menu for previewing graphs of experimental and recovered characteristics and residuals, estimated parameters dependence and DataSet properties. Preview Graphs Opens Preview Window for two-dimensional preview of the experimental and recovered characteristics and residuals. Parameters vs. ID Opens "Fit parameter vs. analysis ID view" form to inspect the dependence of the estimated parameter versus performed analysis. Preview FQ Criteria Opens "Fit Quality Criteria preview" form to preview both numerical and graphical fit quality criteria. Data Set Properties Opens Measurements Database and locates the analysed data. Use the commands of the Reports menu for setting the page setup and previewing and printing automatically created reports. Analysis Report... Generates and previews the Analysis Report. Opens Report Options dialog box to specify the information which will be included in to the Report and set the filter on the Analysis table for selecting the records. Contains menu commands for communicating with TRFA Data Processor Advanced and performing some service database functions. Pack Tables Reduce size of tables by releasing any free space. Empty Analysis Tables Deletes all records from all tables, except Templates and Custom Models tables. Check and Repair Tables Checks all tables and repairs them if they are corrupted. 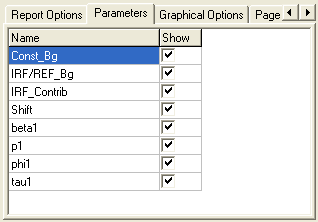 Options menu item Opens Options Dialog box to set Borland Database Engine (BDE) internal variables. Do not modify this settings if you are a member of the administrator group. Open in TRFA DP Adv Opens current analysis in the TRFA Data Processor Advanced. Use commands of the Help menu to access the help and get information about the copyright. Help Contents Opens Help topic contents. About Displays the copyright and version number for Analysis Database. The Toolbar is a row of buttons at the top of the Main window which represents application commands. Clicking one of the buttons is a quick alternative way to choose a command from the Menu. Buttons on the toolbar are activated or deactivated according to the state of the application. To find out more about the functionality of any toolbar button, click this button on the figure above. The Toolbar has short Help Hints. Help Hint is the pop-up text that appears when the mouse pointer passes over a toolbar button. Button "View Table as Datasheet" views the table as datasheet. Button "View Table as Form" views the table as form. Button "Open in TRFA DP Adv" opens the current analysis in the TRFA Data Processor Advanced. Button "Ascending Sort" sorts records of the table in ascending order by the selected field. Button "Descending Sort" sorts records of the table in descending order by the selected field. Button "Quick Search" displays a search box for the corresponding field. If you want to find quickly the necessary record you should type the first few characters and click Enter. In this case the application will automatically select the first record that contains at the beginning the characters, which matched the typed ones. For the Numeric, Logical and Data/Time fields you should type the whole value for the correspondent field. To close the search box, click Esc. Button "Filter" opens Filter dialog box that allows creating the filter that can be applied to the selected table If this filter is applied, the only table records that correspond to the filter criteria will be displayed. Button "Preview" opens Preview Window for two-dimensional preview of the experimental and recovered characteristics and residuals. Button "Help" opens Help topic contents. Such operations as moving from one record to another, deleting records and editing information are supported by the Database Navigator. Navigator button First moves to the first record. Navigator button Previous moves to the previous record. Navigator button Next moves to the next record. Navigator button Last moves to the last record. Navigator button Delete deletes the current record. Navigator button Edit switches the state of the table in the edit mode. After updating information it is possible to save changes by pressing the Post button or cancel changes by pressing the Cancel button. Navigator button Post saves current record. Navigator button Cancel cancels changes. Navigator button Refresh refreshes the information in the table. Valuable in multiuser application when several users work with the Database simultaneously. This page is used for viewing the configuration and properties of the analysis. 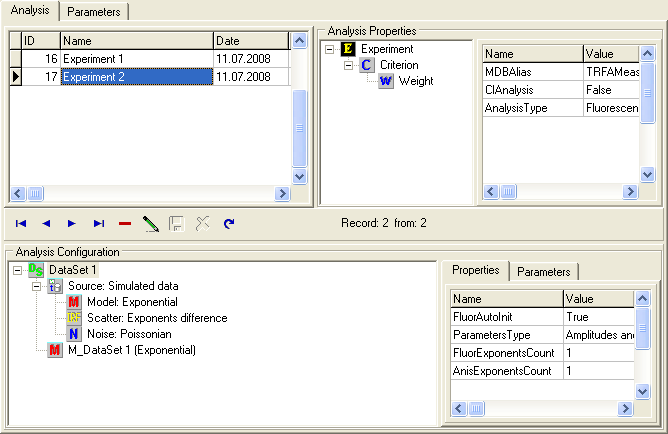 Analysis table is the main table in the Analysis Database (top left grid). If you select the record in this table you get all information about one particular analysis. Use the Database Navigator to manage the records of the Analysis table. The tables, which are depended on the Analysis table, contain properties and parameters of the analysis and configuration of the analysis. If you delete the record in the Analysis table, all records that are related to the analysis will be deleted. This table displays the information about the performed and stored analysis. It can be viewed as form view or datasheet view. 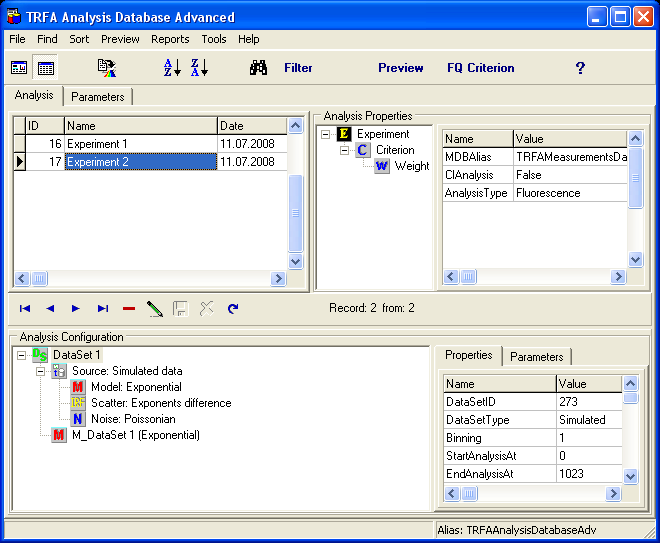 AnalysisID Contains the unique identifier of the analysis. It is named as ID. Name Contains the name of the analysis. AnalysisDate Contains the date when the analysis was performed and stored into the database. Description Contains the short description of the analysis. All actions under Analysis table are collected in local menu. • Field AnalysisID is read only. • This table can be sorted by any field (except Description). To perform the sorting by the given field, select this field and click Ascending/Descending Sort button in the Toolbar or choose Ascending/Descending menu items in the local menu. • Use Quick Search button in the Toolbar or choose Quick Search menu items in local menu for quick searching the information in the selected field. Delete Deletes the selected record. Edit Switches state of the table in edit mode. Post Saves current record in the Database. Preview Opens Preview Window for two-dimensional preview of the experimental and recovered characteristics and residuals. Generate Report Generates the report based on the selected record. 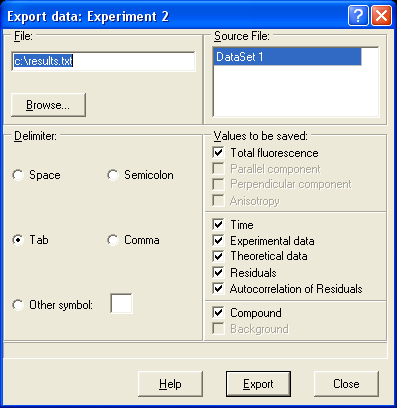 Export Data Opens Export data dialog box that allows exporting experimental and recovered characteristics and residuals to the text file. Open in TRFA DP Adv Opens the current analysis in the TRFA Data Processor Advanced. Find Record Allows to set the filter on the table and to search the information by typing the first few characters. View Allows to change the view of the table. Allows to set the filter on the table and to search the information by typing the first few characters. Remove Filter Removes the filter from the table (without clearing the filter expression). Allows to change the view of the table. View As Form Displays the table as Form. View As Datasheet Displays the table as Datasheet. Analysis Configuration treeview shows a tree of objects related to the analysis properties. Analysis properties table displays the properties of the object selected in the Analysis Configuration treeview. 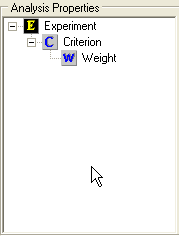 The names of the analysis properties objects are displayed on the right of the corresponding icons. If the current analysis properties objects contains some dependent objects then it is supplied with a special indicator or . Click this indicator to show or hide the dependent objects containing in the current object. This table displays the properties of the object selected in the Analysis properties treeview. Name Contains the name of the property. Value Contains the value of the property. All actions under Analysis Properties table are collected in local menu. • All fields are read only. • This table can be sorted by any field. To perform the sorting by the given field, select this field and click Ascending/Descending Sort button in the Toolbar or choose Ascending/Descending menu items in the local menu. Analysis configuration treeview displays configuration of the analysis. It is based on the ExpDSMod table that links together the DataSet (stored in the Measurements Database) the Model and the Analysis. Locate DataSet Opens Data Set Linker form. Is used for linking analysis with DataSets stored in other Measurements Databases, registered on the machine. It helps to restore the link to the Measurements Database. Data Set Properties Opens Measurements Database and locate the DataSet. These tables displays the properties and parameters of the selected object in the Analysis Configuration tree view. Name Contains the name of the external parameter. Value Contains the value of the external parameter. All actions under Properties and Parameters tables are collected in local menu. • These tables can be sorted by any field. To perform the sorting by the given field, select this field and click Ascending/Descending Sort button in the Toolbar or choose Ascending/Descending menu items in the local menu. Click the corresponding item to get more information about it. The names of the parameters groups and parameters are displayed on the right of the corresponding icons. If the current parameters group is not empty then it is supplied with a special indicator or . 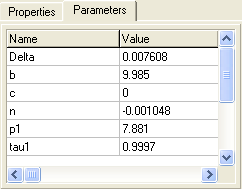 Click this indicator to show or hide the parameters containing in the current parameters group. 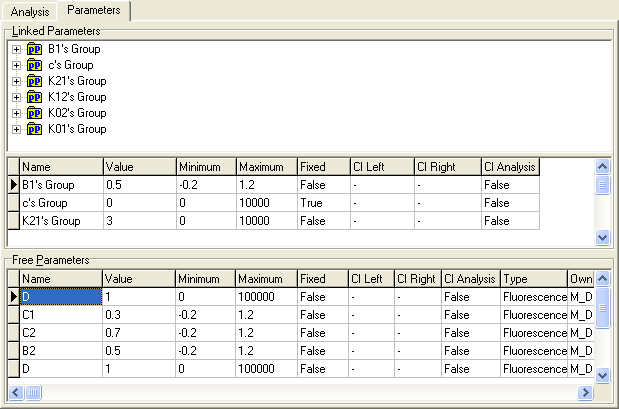 This table displays the settings of the parameters groups in the current analysis. Name Contains the name of the parameters group. 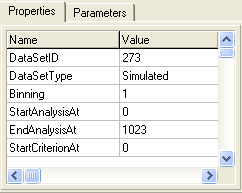 Value Contains the value of the parameter or parameters group. This value should belong to the interval from the minimum value contained in the field Minimum to the maximum value contained in the field Maximum. Minimum Contains the minimum constraint for the value of parameter or parameters group. 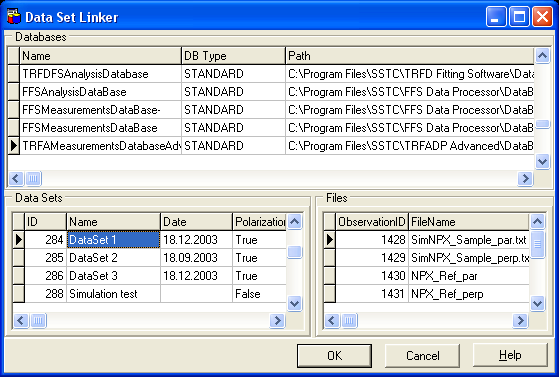 Fixed Indicates whether the current parameter or parameters group should be fitted during the analysis. If Fixed is true then the value of the current parameter will be constant during the analysis, otherwise the parameter will be fitted. CI Left, CI Right Contain left and right bound of the confidence interval, which was obtained for the current parameters group if the confidence interval analysis has been performed for it. 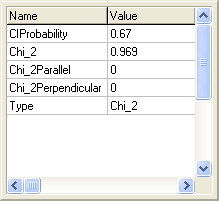 CI Analysis Indicates whether the confidence interval analysis has been performed for the current parameters group. All actions under Linked Parameters table are collected in local menu. This table displays the settings of the parameters related to the current analysis. Name Contains the name of the parameter. Owner Contains the name and type of the model, to which the current parameter belongs. All actions under Free Parameters table are collected in local menu. Refresh Refreshes data in the table. This window is used for two-dimensional display of the experimental and recovered characteristics and residuals. The name of the analysis is displayed in the title of this window. The window consists of three charts: Decays, Residuals and Autocorrelation of residuals. Use local menu of 2D Chart for customizing the chart, export chart data to text and BMP files, save, apply and reset user defined settings. Use Graphics toolbar in the bottom of this window to customize the view of decays. Use Navigator in the bottom of this window to look through other datasets participating in the current analysis. Close button closes this window. Help button opens the help window that describes how to work with Preview window. Navigator allows to look through all DataSets participated in the analysis. Graphics Toolbar contains buttons for changing view of the graphics window. This toolbar has short Help Hints. Help Hint is the pop-up text that appears when the mouse pointer passes over a toolbar button. 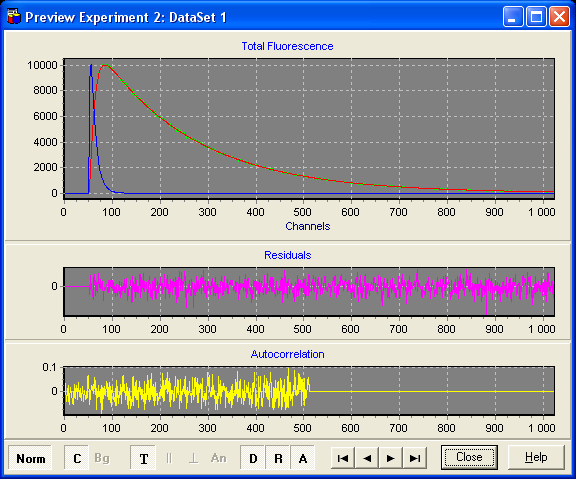 If the button Norm is down the Instrumental response function (or Reference compound) curve is normalized to the maximum of sample fluorescence decay before it is displayed in the decays chart. If the button C is down the scatter or reference compound is viewed. If the button Bg is down the background intensity is viewed. Button T displays the curves related to the total fluorescence decay. Button || displays the curves related to the parallel fluorescence decay. This button is enabled only in the case if data set contains parallel and perpendicular polarization components. Button ┴ displays the curves related to the perpendicular fluorescence decay. This button is enabled only in the case if data set contains parallel and perpendicular polarization components. Button An displays the curves related to the fluorescence anisotropy. This button is enabled only in the case if data set contains parallel and perpendicular polarization components. Button D makes the decays chart visible. Button R makes the residuals chart visible. Button A makes the residuals autocorrelation chart visible. Use this form for visualization of fit quality criteria, both numerical and graphical. Criteria group box shows all calculated criteria. Select the criterion to preview. DataSet group box displays the name of the analysed DataSet. To view criteria calculated for other DataSets participated in the analysis use Database navigator. 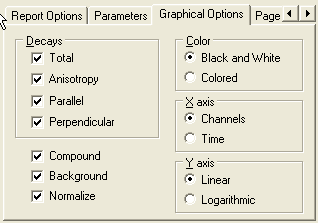 Graphic type tab control previews criteria. It can contains up to four tabs, for total, parallel, perpendicular and anisotropy components. Database navigator views criteria calculated for other DataSets participated in the analysis. Button "Close" closes Fit Quality criteria preview form. Button "Help" opens the help window that describes how to work with Fit Quality criteria preview form. Button "Filter" opens Filter dialog box. Button "Ok" closes the dialog box and starts creation of the report. Button "Help" opens the help window that describes how to work with Report Options dialog box. Button "Cancel" closes the dialog box without creation of the report. Check the "Analysis properties" check box if you want to include into the Report the properties of the analysis. Check the "Analysis Configuration" check box if you want to include into the Report the configuration of the analysis. Check the "Files information" check box if you want to include the information about the analysed files into the Report. 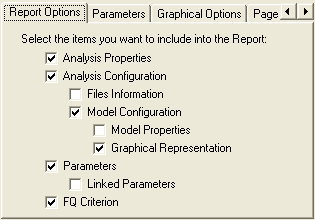 Check the "Model configuration" check box if you want to include the model configuration into the Report. Check the "Model Properties" check box if you want to include into the Report the properties of the models. Model Properties check box is enabled if Analysis Configuration check box is checked. Check the "Graphical representation" check box if you want to include into the Report the graphs of experimental and recovered characteristics, residuals and autocorrelation of the residuals. Graphical representation check box is enabled if Analysis Configuration check box is checked. Check the "Parameters" check box if you want to include the parameters and the parameters groups of the analysis into the Report. It is possible to select the parameters which will be included into the Report in the Parameters page. Check the "Linked Parameters" check box if you want to include into the Report the parameters which are combined in a parameters group. Linked Parameters check box is enabled if Parameters check box is checked. Check the "FQ Criteria" check box if you want to include the Fit Quality Criteria of the analysis into the Report. "Decays" group box is used for customizing the graphics chart. If checkbox is checked the correspondent curve will be displayed in the Report. 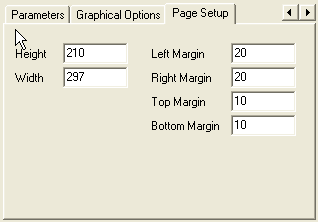 "View data" check boxes are used for customizing the graphics chart. If checkbox is checked the correspondent curve will be displayed in the Report. "Y axis" radio group is used for setting Y axis labels format. The labels format depends on type of the characteristic if "Auto" is checked. "X axis" radio group is used for setting X axis labels format. The labels format depends on type of the characteristic if "Auto" is checked. 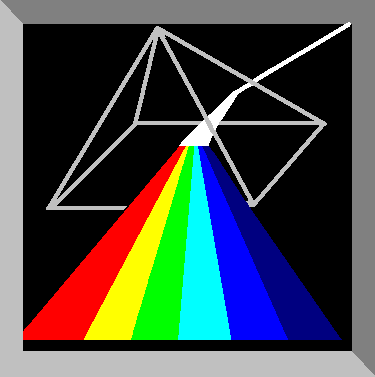 "Color" radio group is used for graph customizing. "File" edit box contains the name of the file where results of the analysis will be exported. Button "Browse" opens the standard Windows Open dialog box in which the path and the name of the file can be chosen. "Data Sets" list is used to choose the Data Sets, the data will be exported from. "Delimeters" group box allows to set the delimeter that will be used to separate values in the exported file. "Arrays to be saved" group box is used to choose the arrays of values to be saved. Check the corresponding check box to export the array. Button "Export" executes the export procedure. Button "Help" opens the help window that describes how to work with Export data dialog box. Button "Close" finishes the work with Export data dialog box. Button "Ok" closes the Data Set Linker form and replaces DataSet ID with the selected one. Button "Cancel" finishes work with Data Set Linker form without any changes. Button "Help" opens the help window that describes how to work with Data Set Linker form. 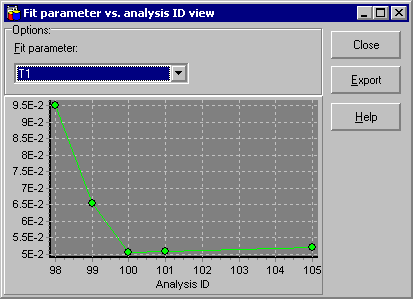 2D Chart displays the Fit parameter vs. analysis ID curve. The values of the fit parameters which have the name selected in the Fit parameter combobox are displayed along the vertical axis and analysis ID value is displayed along the horizontal axis. 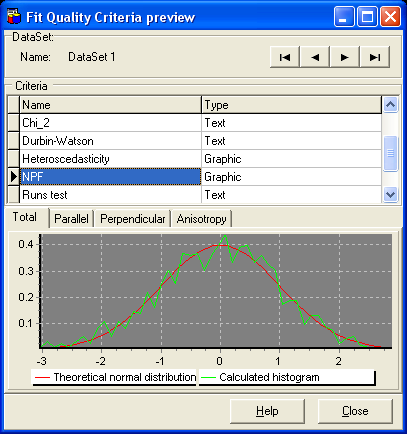 Fit parameter combobox is used to chose fit parameter to be displayed on the graph. Button "Help" opens the help window that describes how to work with "Fit parameter vs. analysis ID view" form. Button "Close" closes the "Fit parameter vs. analysis ID view" form. Button "Help" opens the help window that describes how to work with "Fit parameter vs. external parameter view" form. Button "Export" exports graph data to the text file.